Maxie's first fish - a tilapia! A couple weeks ago, we went to my coworker and good friend’s father-in-law’s place for his new house celebration. He’d built a new house on top of the foundations of an older one at his 15 rai (1 rai = 0.4 acres) property five minutes walk from our home. 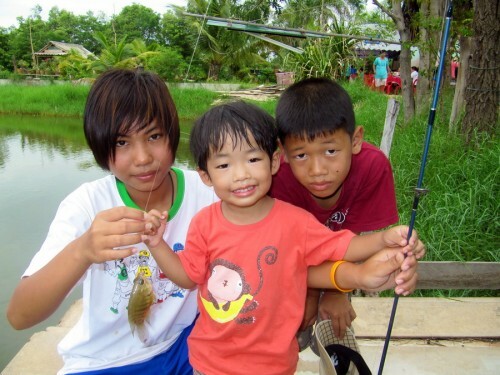 There are several fish ponds on the site, stocked with all kinds of fish including tilapia, catfish, snakehead, etc. This was actually his second fish, perhaps a bleeker, related to carp in any case. We were fishing the shallows in 1 meter deep water with fallen submerged trees everywhere, so my sliding sinker rig did a perfect job. The total for the day was five small fish between Max and his friends, and typically, they all got bored after pulling in their own fish. Max was scared to actually touch the fish, just as I remember being, so it was a good learning experience for everybody. On the deep side of the pond we were fishing they apparently catch 7-8 kilogram catfish of various species (giant Mekong cats included!) on a regular basis; I saw some they pulled that morning in the 5kg range waiting to be prepared for eating, so I don’t doubt it. I was trying to keep the kids from being traumatized by a leviathan, so we stayed in the shallows!